Whether you want to improve your skills, expertise or career growth, with Certkingdom's training and certification resources help you achieve your goals. Our exams files feature hands-on tasks and real-world scenarios; in just a matter of days, you'll be more productive and embracing new technology standards. Our online resources and events enable you to focus on learning just what you want on your timeframe. You get access to every exams files and there continuously update our study materials; these exam updates are supplied free of charge to our valued customers. Get the best 010-002 exam Training; as you study from our exam-files "Best Materials Great Results"
*Associate (CMA) Certification is an entry level certification that is attained by passing a single exam. *Developer (CMDEV) and DBA (CMDBA) Certification is available for MySQL 5.0 and is attained by passing two exams. *MySQL Cluster certification for MySQL 5.1 is attained by holders of the CMDBA certification by passing a single exam and is not version specific. All exams are administered through Prometric testing centers available world-wide. The MySQL Certified Associate credential provides a foundation for further MySQL certification. Unlike other MySQL certifications, the Associate certification is not tied to any particular version of MySQL, but focuses on details of using MySQL that are universal no matter what version of the software you are using. The best way to prepare for the Certified MySQL Associate exams is to take part in the MySQL for Beginners training course offered by MySQL. This and other courses are offered world-wide several times per year. See http://www.mysql.com/training for more information on upcoming courses. Those interested in self-study for this certification should see Preparing for the Associate Exam section of Certification Candidate Guide. The MySQL Certification program is tightly linked with the MySQL training program. The courses MySQL 5.0 for Developers » and MySQL 5.0 for Database Administrators » both offer excellent opportunities for preparing for the certification exams. If an official MySQL training program is not an option for you, a less intensive (but more time-consuming) method for studying is by obtaining a MySQL 5.0 Certification Study Guide ». * To attain CMDEV certification, the candidate must pass the Developer-I and Developer-II exams. * For Database Administrator certification, the candidate must pass the DBA-I and DBA-II exams. Although the recommended progression through these exams is to complete first the 'I' part and then the 'II' part, the exam part numbers do not express an advancement level. Rather, each part covers distinct areas of expertise, and the exams may be taken in any order. A CMDEV or CMDBA certification is attained only when both exams for that certification are passed. The MySQL 5.1 Cluster DBA Certification (CMCDBA) is a specialization exam for those that design, deploy and administer MySQL Cluster setups. Cluster certification is part of the DBA track, and represents an advancement level exceeding CMDBA certification. CMCDBA can be attained only by Certified MySQL DBAs. In order to attain CMCDBA certification, you must attain CMDBA certification and pass one CMCDBA exam. The MySQL Certification program is tightly linked with the MySQL training program. The course MySQL Cluster for High Availability » is an excellent opportunity for preparing for the certification exam. For self-study, the official MySQL Cluster Certification Study Guide is recommended. To attain Cluster DBA certification, the candidate must first be a Certified MySQL Database Administrator (CMDBA). Once the CMDBA certification has been acquired, the candidate must pass the Cluster Certification exam to obtain CMCDBA certification. Make yourself more valuable in today's competitive computer industry Certkingdom's preparation material includes the most excellent features, prepared by the same dedicated experts who have come together to offer an integrated solution. We provide the most excellent and simple method to pass your MySQL MySQL Certified 010-002 exam on the first attempt "GUARANTEED". will prepare you for your exam with guaranteed results, 010-002 Study Guide. Your exam will download as a single 010-002 PDF or complete 010-002 testing engine as well as over +4000 other technical exam PDF and exam engine downloads. Forget buying your prep materials separately at three time the price of our unlimited access plan - skip the 010-002 audio exams and select the one package that gives it all to you at your discretion: 010-002 Study Materials featuring the exam engine. Beyond knowing the answer, and actually understanding the 010-002 test questions puts you one step ahead of the test. Completely understanding a concept and reasoning behind how something works, makes your task second nature. Your 010-002 quiz will melt in your hands if you know the logic behind the concepts. Any legitimate MySQL MySQL Certified prep materials should enforce this style of learning - but you will be hard pressed to find more than a MySQL MySQL Certified practice test anywhere other than Certkingdom. This is where your MySQL MySQL Certified 010-002 exam prep really takes off, in the testing your knowledge and ability to quickly come up with answers in the 010-002 online tests. Using MySQL Certified 010-002 practice exams is an excellent way to increase response time and queue certain answers to common issues. All MySQL MySQL Certified online tests begin somewhere, and that is what the MySQL MySQL Certified training course will do for you: create a foundation to build on. Study guides are essentially a detailed MySQL MySQL Certified 010-002 tutorial and are great introductions to new MySQL MySQL Certified training courses as you advance. The content is always relevant, and compound again to make you pass your 010-002 exams on the first attempt. You will frequently find these 010-002 PDF files downloadable and can then archive or print them for extra reading or studying on-the-go. For some, this is the best way to get the latest MySQL MySQL Certified 010-002 training. However you decide to learn 010-002 exam topics is up to you and your learning style. 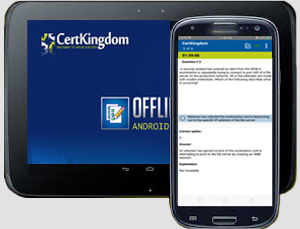 The Certkingdom MySQL MySQL Certified products and tools are designed to work well with every learning style. Give us a try and sample our work. You'll be glad you did. * MySQL Certified 010-002 prep files are frequently updated to maintain accuracy. Your courses will always be up to date. Get MySQL Certified ebooks from Certkingdom which contain real 010-002 exam questions and answers. You WILL pass your MySQL Certified exam on the first attempt using only Certkingdom's MySQL Certified excellent preparation tools and tutorials. Thank You! I would just like to thank CertKingdom.com for the MySQL MySQL Certified 010-002 test guide that I bought a couple months ago and I took my test and pass overwhelmingly. I completed the test of 50 questions in about 90 minutes I must say that their Q & A with Explanation are very amazing and easy to learn. I passed the MySQL MySQL Certified 010-002 exam yesterday, and now it's on to security exam. Couldn't have done it with out you. Thanks very much.